Multi-class confusion matrix library in Python. threshold is added in version 0.9 for real value prediction. file is added in version 0.9.5 in order to load saved confusion matrix with .obj format generated by save_obj method. relabel method is added in version 1.5 in order to change ConfusionMatrix classnames. This option has been added in version 1.9 in order to recommend most related parameters considering the characteristics of the input dataset. The characteristics according to which the parameters are suggested are balance/imbalance and binary/multiclass. All suggestions can be categorized into three main groups: imbalanced dataset, binary classification for a balanced dataset, and multi-class classification for a balanced dataset. The recommendation lists have been gathered according to the respective paper of each parameter and the capabilities which had been claimed by the paper. Try PyCM in your browser! Just fill an issue and describe it. We'll check it ASAP! or send an email to info@pycm.ir. 1- J. R. Landis, G. G. Koch, “The measurement of observer agreement for categorical data. Biometrics,” in International Biometric Society, pp. 159–174, 1977. 2- D. M. W. Powers, “Evaluation: from precision, recall and f-measure to roc, informedness, markedness & correlation,” in Journal of Machine Learning Technologies, pp.37-63, 2011. 3- C. Sammut, G. Webb, “Encyclopedia of Machine Learning” in Springer, 2011. 4- J. L. Fleiss, “Measuring nominal scale agreement among many raters,” in Psychological Bulletin, pp. 378-382. 5- D.G. Altman, “Practical Statistics for Medical Research,” in Chapman and Hall, 1990. 7- W. A. Scott, “Reliability of content analysis: The case of nominal scaling,” in Public Opinion Quarterly, pp. 321–325, 1955. 8- E. M. Bennett, R. Alpert, and A. C. Goldstein, “Communication through limited response questioning,” in The Public Opinion Quarterly, pp. 303–308, 1954. 9- D. V. Cicchetti, "Guidelines, criteria, and rules of thumb for evaluating normed and standardized assessment instruments in psychology," in Psychological Assessment, pp. 284–290, 1994. 10- R.B. Davies, "Algorithm AS155: The Distributions of a Linear Combination of χ2 Random Variables," in Journal of the Royal Statistical Society, pp. 323–333, 1980. 11- S. Kullback, R. A. Leibler "On information and sufficiency," in Annals of Mathematical Statistics, pp. 79–86, 1951. 12- L. A. Goodman, W. H. Kruskal, "Measures of Association for Cross Classifications, IV: Simplification of Asymptotic Variances," in Journal of the American Statistical Association, pp. 415–421, 1972. 13- L. A. Goodman, W. H. Kruskal, "Measures of Association for Cross Classifications III: Approximate Sampling Theory," in Journal of the American Statistical Association, pp. 310–364, 1963. 14- T. Byrt, J. Bishop and J. B. Carlin, “Bias, prevalence, and kappa,” in Journal of Clinical Epidemiology pp. 423-429, 1993. 15- M. Shepperd, D. Bowes, and T. Hall, “Researcher Bias: The Use of Machine Learning in Software Defect Prediction,” in IEEE Transactions on Software Engineering, pp. 603-616, 2014. 16- X. Deng, Q. Liu, Y. Deng, and S. Mahadevan, “An improved method to construct basic probability assignment based on the confusion matrix for classification problem, ” in Information Sciences, pp.250-261, 2016. 17- J.-M. Wei, X.-J. Yuan, Q.-H. Hu, and S.-Q. J. E. S. w. A. Wang, "A novel measure for evaluating classifiers," vol. 37, no. 5, pp. 3799-3809, 2010. 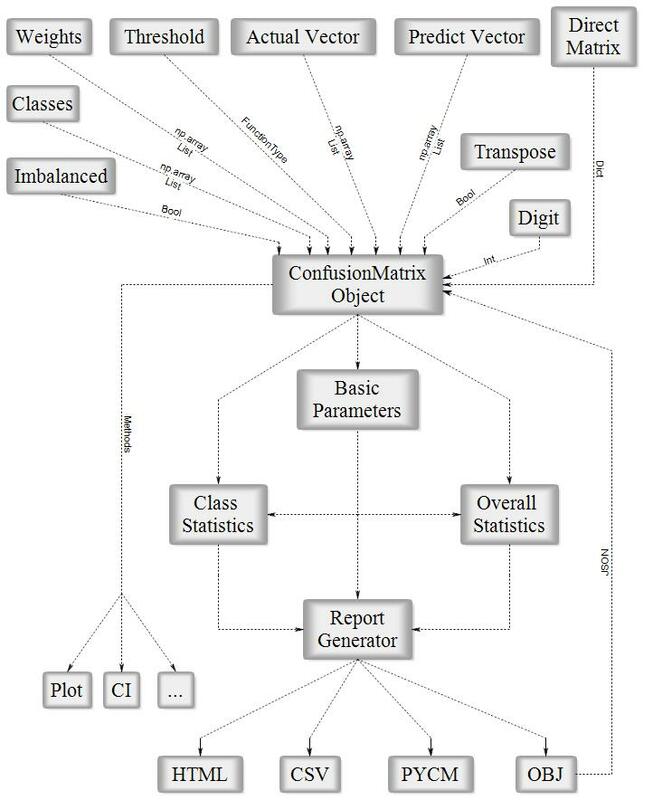 18- I. Kononenko and I. J. M. L. Bratko, "Information-based evaluation criterion for classifier's performance," vol. 6, no. 1, pp. 67-80, 1991. 19- R. Delgado and J. D. Núñez-González, "Enhancing Confusion Entropy as Measure for Evaluating Classifiers," in The 13th International Conference on Soft Computing Models in Industrial and Environmental Applications, 2018, pp. 79-89: Springer. 20- J. J. C. b. Gorodkin and chemistry, "Comparing two K-category assignments by a K-category correlation coefficient," vol. 28, no. 5-6, pp. 367-374, 2004. 21- C. O. Freitas, J. M. De Carvalho, J. Oliveira, S. B. Aires, and R. Sabourin, "Confusion matrix disagreement for multiple classifiers," in Iberoamerican Congress on Pattern Recognition, 2007, pp. 387-396: Springer. 22- P. Branco, L. Torgo, and R. P. Ribeiro, "Relevance-based evaluation metrics for multi-class imbalanced domains," in Pacific-Asia Conference on Knowledge Discovery and Data Mining, 2017, pp. 698-710: Springer. 23- D. Ballabio, F. Grisoni, R. J. C. Todeschini, and I. L. Systems, "Multivariate comparison of classification performance measures," vol. 174, pp. 33-44, 2018. 24- J. J. E. Cohen and p. measurement, "A coefficient of agreement for nominal scales," vol. 20, no. 1, pp. 37-46, 1960. 25- S. Siegel, "Nonparametric statistics for the behavioral sciences," 1956. 26- H. Cramér, Mathematical methods of statistics (PMS-9). Princeton university press, 2016. 27- B. W. J. B. e. B. A.-P. S. Matthews, "Comparison of the predicted and observed secondary structure of T4 phage lysozyme," vol. 405, no. 2, pp. 442-451, 1975. 28- J. A. J. S. Swets, "The relative operating characteristic in psychology: a technique for isolating effects of response bias finds wide use in the study of perception and cognition," vol. 182, no. 4116, pp. 990-1000, 1973. 29- P. J. B. S. V. S. N. Jaccard, "Étude comparative de la distribution florale dans une portion des Alpes et des Jura," vol. 37, pp. 547-579, 1901. 30- T. M. Cover and J. A. Thomas, Elements of information theory. John Wiley & Sons, 2012. 31- E. S. Keeping, Introduction to statistical inference. Courier Corporation, 1995. 32- V. Sindhwani, P. Bhattacharya, and S. Rakshit, "Information theoretic feature crediting in multiclass support vector machines," in Proceedings of the 2001 SIAM International Conference on Data Mining, 2001, pp. 1-18: SIAM. 33- M. Bekkar, H. K. Djemaa, and T. A. J. J. I. E. A. Alitouche, "Evaluation measures for models assessment over imbalanced data sets," vol. 3, no. 10, 2013. 34- W. J. J. C. Youden, "Index for rating diagnostic tests," vol. 3, no. 1, pp. 32-35, 1950. 35- S. Brin, R. Motwani, J. D. Ullman, and S. J. A. S. R. Tsur, "Dynamic itemset counting and implication rules for market basket data," vol. 26, no. 2, pp. 255-264, 1997. 36- S. J. T. J. o. O. S. S. Raschka, "MLxtend: Providing machine learning and data science utilities and extensions to Python’s scientific computing stack," vol. 3, no. 24, 2018. 37- J. BRAy and J. CuRTIS, "An ordination of upland forest communities of southern Wisconsin.-ecological Monographs," ed: Ithaca, 1957. 38- J. L. Fleiss, J. Cohen, and B. S. J. P. B. Everitt, "Large sample standard errors of kappa and weighted kappa," vol. 72, no. 5, p. 323, 1969. 39- M. Felkin, "Comparing classification results between n-ary and binary problems," in Quality Measures in Data Mining: Springer, 2007, pp. 277-301. 40- R. Ranawana and V. Palade, "Optimized Precision-A new measure for classifier performance evaluation," in 2006 IEEE International Conference on Evolutionary Computation, 2006, pp. 2254-2261: IEEE. 41- V. García, R. A. Mollineda, and J. S. Sánchez, "Index of balanced accuracy: A performance measure for skewed class distributions," in Iberian Conference on Pattern Recognition and Image Analysis, 2009, pp. 441-448: Springer. 42- P. Branco, L. Torgo, and R. P. J. A. C. S. Ribeiro, "A survey of predictive modeling on imbalanced domains," vol. 49, no. 2, p. 31, 2016. 43- K. Pearson, "Notes on Regression and Inheritance in the Case of Two Parents Proceedings of the Royal Society of London, 58, 240-242," ed, 1895. 44- W. J. I. Conover, New York, "Practical Nonparametric Statistics, John Wiley and Sons," 1999. Haghighi, S., Jasemi, M., Hessabi, S. and Zolanvari, A. (2018). PyCM: Multiclass confusion matrix library in Python. Journal of Open Source Software, 3(25), p.729. If you do like our project and we hope that you do, can you please support us? Our project is not and is never going to be working for profit. We need the money just so we can continue doing what we do ;-) .